STUDY OF THE NZIC PATTERNS USED IN AUSTRALIA. The New Zealand Insurance Company Limited (NZIC) had offices up and down the length of Queensland, and indeed around Australia. Many of these offices had perforating devices with the letters NZ/IC and to make matters more confusing the patterns produced by these devices are in most cases quite similar. They used these devices to create perfins in both postage and revenue stamps. I have been working on an online catalogue of perfins on Australian revenue and railway stamps entitled “The Private Revenue Perfins of Australia” with well known revenue collector Dave Elsmore from Queensland. We are building the catalogue State by State starting with Queensland and this meant collecting information about Queensland users including the users of the NZIC patterns. Because of the link to New Zealand these NZIC patterns have always been of special interest to New Zealand perfin collectors who consider these to be New Zealand patterns. Therefore in order to assist with this research I purchased a copy of “New Zealand Stamps with Perforated Initials” (NZSWPI) by R D Samuel (2nd Edition 2010). This is an excellent catalogue and Samuel and the editors bring the New Zealand patterns alive with many images, as well as a pocket history of the New Zealand perfin users. The scope includes reference to patterns used in New Zealand and abroad, including Australia. For the patterns on Australian stamps Samuel relies heavily on, “Handbook of Australian Perfins” (HAPP - Mathews 2003) and to a lesser extent “Commercial Perfins of Australia” (CPA -Grant and Mathews 1992 ) and these extracts are in some instances cross referenced with somewhat dated and disjointed references to Samuel’s first edition (1968) and to images provided by NZ perfin pioneer David Dell (1993). In short none of these publications / references, in isolation or indeed collectively; as is attempted in Samuel’s catalogue, adequately cover the rather complex web of offices, devices and patterns that are the NZ/IC groups. In particular the way that Mathews categorises similar patterns as “types” of a single pattern is unhelpful and often misleading, especially when you are trying to build a definitive list of the patterns, devices and their locations. In many cases the patterns within the NZ/IC groups are similar but they have been made by different devices in remote locations. Given this there is a need for high quality images of patterns so that collectors can confirm which pattern is which. Unfortunately both CPA and HAPP and therefore NZSWPI have many poor or imperfect pattern images and therefore the pattern groups are littered with miss reported usage dates and other errors. As far as I can determine there are only 6 NZ/IC patterns used on revenue stamps but in order to describe these in context I found it necessary to clarify the entire pattern groups, build usage timelines and provide revised images of all patterns. For numbering I have used HAPP numbers and added to the catalogue number sequence as required. For patterns that are found on revenue stamps and therefore fall within the scope of Dave Elsmore and my new web based catalogue, I have used the identification system which is Elsmore/Coath number or EC.#. It actually uses letters not numbers and because these EC “numbers” are State based I will specify the State in the listing, for instance for the first NZIC found on a revenue stamps it is denoted as EC NZ/IC.a (Qld). The images in CPA and HAPP of the patterns of the NZ/IC group are generally fair. However NZIC.1, .4, .5 and .6 are all distorted from the true patterns. As stated above the use of “types” to define variation within patterns and incorrectly attributing devices to Company office locations are the chief areas of confusion in this group. This pattern is listed as being used in both the Adelaide and Brisbane offices. This is entirely possible, and perfin devices have been known to move between offices with other users. What is more the usage does not overlap. The device was first used in Brisbane where you often see the pin in the cross bar of the N missing. The pins are quite fine in much the same manner of the Melbourne device NZIC.6. In 1908 it moved to Adelaide but there seem to have been subtle changes to the device as the pattern from this point features slightly thicker pins and makes a clearer strike with the pin in the N always in evidence. It is possible that the device was refurbished prior to going into service in Adelaide. The top pin of the I is often missing in the Adelaide usage. The CPA and HAPP images are imperfect but if you overlay a Brisbane version on an Adelaide one you will find that despite the minor change in pin thicknesses the pattern is the same. The pattern is best described as 2 types of a single pattern, a Brisbane type and an Adelaide type. This pattern is found on State postage stamps of Queensland and then postage stamps of South Australia and less commonly on Commonwealth issues until at least 1922. 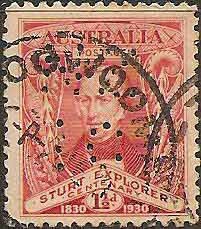 It is not found on revenue stamps of South Australia. Listed in CPA as a Brisbane device with only one type this was altered in HAPP to be 2 types and it was stated to have been used at the Adelaide and Brisbane offices, as with NZIC.1. Actually the “types” are 2 devices, one located in Brisbane and the other in Toowoomba. The CPA/HAPP images are both accurate representations of the Brisbane device so I have elected to leave NZIC.2 as the Brisbane device and describe the Toowoomba device as NZIC.8. NZIC.2 is found on postage stamps of the Commonwealth period (between 1913 and 1920+) and also on revenue stamps of Queensland in around the same period. This is the pattern as listed in both CPA/HAPP and the image is a good representation of the pattern. It is reported as a Brisbane device but it is actually a Townsville device. 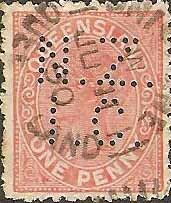 It is found used on postage stamps of both Queensland and those of the early Commonwealth period. 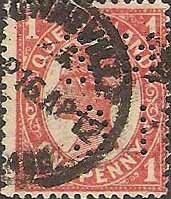 It is also found on Queensland revenue stamps. This pattern with its characteristic full stops after each letter is the easiest of the NZIC group to identify. Samuel (2010) includes some great detail about it (see pages 73 and 74) including an image of the device and 2 specimen impressions of the pattern. The specimen strikes suggest that it is possible that it was a 2 head device, but if this is the case the images are so similar as to be the same. I would doubt it is anything more than a single head device as it seems to be able to give good central strikes onto a wide variety of stamp issues of different sizes and this is much easier to achieve with a single head device. Further the separation shown on the specimen strikes is not consistent with the spacing of multiples strikes that I have seen. The usage reported by Dell, Mathews and Samuel, collectively, is interesting and consistent with what I have found. I have seen Rockhampton, Maryborough, Charters Towers, Townsville and Brisbane usage as well as use on NSW revenues, which would suggest the device spent time in the company’s Sydney office. What is more much of this usage overlaps. I am yet to find a usage with the same date but I have postmarks 9 days apart in September of 1898 from Rockhampton and Townsville. This proves little as the date the stamp is perforated and the date it is used will vary but it does indicate the close timing of remote usage. These may be receiving postmarks from incoming mail or use by travelling agents, as the published history of the Company a “Bold Century” (published by the company in 1959) indicates that formal offices in Townsville and Rockhampton did not open until 1907 and 1908 respectively. Still the evidence of remote usage in many Queensland towns as well as interstate in the same period cannot be discounted and it is possible that there were multiple devices with identical dies. Alternatively it is possible that the device was located at a central office and that perforated stamps were issued to user areas from this office. This is the method adopted by larger users such as State Governments. 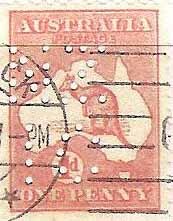 The pattern is found on postage stamps of Queensland and Australia and revenue stamps of Queensland and New South Wales. This is one of the rarest NZIC’s. The device is distinctive but the images in CPA and HAPP are slightly distorted and are not a true representation of the pattern. From postmark evidence the device was most likely located in the company’s office in Warwick which was a sub office of the Toowoomba office. 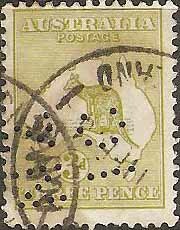 Contrary to the reports in HAPP, which indicates use on Queensland revenues, I can only find this pattern on Australian postage stamps in the Commonwealth period. Also HAPP reports a 2 nd type (refer Update #1). Both of these are likely mistaken reports of the pattern that is NZIC.7 which is found on Queensland revenues and is similar to .5. As reported in CPA and HAPP this is a Melbourne device. The images in CPA and HAPP are the same but they are not very good and the C is rather misshapen and the full stops after the Z and the C are omitted. It is possible that the scan used was from a partial. The pattern was very fine and some pins are missing over its usage. The company had started its office in Melbourne in the 1860’s but the postmarks that I have seen are all from the 1890’s. 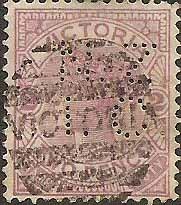 To date it is only reported on the postage stamps of Victoria but the usage is during the period in which postage stamps were inscribed “stamp duty” so it is possible that an example of this rare pattern may be found with revenue use. This pattern is not listed in CPA or HAPP but I have sent details of the pattern to John Mathews and he has allocated the number NZIC.7 to it. It is a pattern from a device located in Cairns and it is found on both revenue and postage stamps over a broad time period. The pattern is rare. 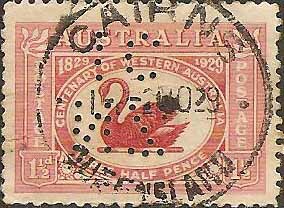 It is found on Australian postage stamps around 1929 but is known on Queensland revenue stamps from around 1910. 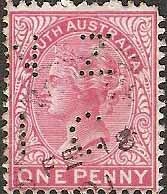 It is found on postage stamps of Australia as well as Queensland revenue stamps. In the study of these NZIC pattern groups I have looked at thousands of these patterns but it is entirely possible that there is evidence that would add to this study and indeed contradict some of my findings. I am happy to share my pattern images with anyone who would like a copy of them so just drop me an email or a letter. Once you have sorted out your NZIC’s I would be keen to hear what you find.